One great way to make that transition from summer to school is with the literacy gazebo. 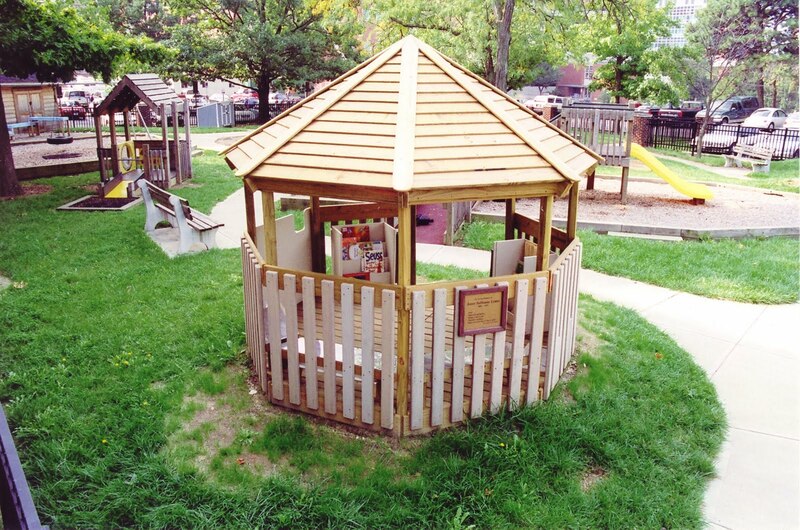 The Literacy Gazebo provides a great place for children to sit and listen to stories, tell stories to other children, or create their own stories using art supplies. Imagine sitting outside with the children. A cool breeze running through your hair, the shelter’s shade keeping everyone comfortable… you can read and create together and enjoy nature’s lovely background all at the same time. This area includes two bookcases and three benches. The sixth side of the area is open for entering and exiting the area. Each bookcase has four different shelves for displaying materials. One of the bookcases is designed to hold art supplies such as paper and markers so children can draw and tell their stories; the second one is designed to hold books. The literacy gazebo will become a favorite landmark for reading, story-telling, and drawing. Children will love the opportunity to stay outdoors, and after an hour of running around in the sun, cooling off in the gazebo while listening to a story will be just the ticket!